Cleaned up the pitted pistons on a set of Nissin radial calipers from a Triumph Speed Triple (being fitted to the 5th Gen front end conversion). Process is the same whatever calipers you have. Pistons removed and you can see the corroded/filthy bits on the exposed portion of the piston lip. The exposed takes all the hearing/cooling/salt spray abuse and are not protected by the caliper. No surprise they look like sh!t. Dirty pitted one on the left. Polished one on the right. Pitted big piston on top. 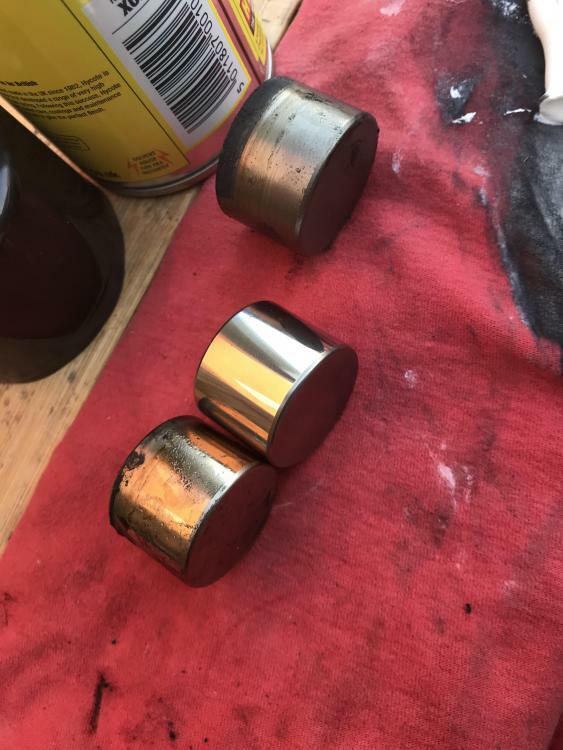 Method: lay some old material (denim works best) on a flat surface, apply some metal polish (I used Autosol) and rub the piston up-and-down along the corroded section. See the black streak in the picture above. This is really smooths down the burrs and the phosphoric acid in the polish helps the newly exposed metal form a protective oxide layer. Pitting will never be completely removed but it certainly gets smoother. 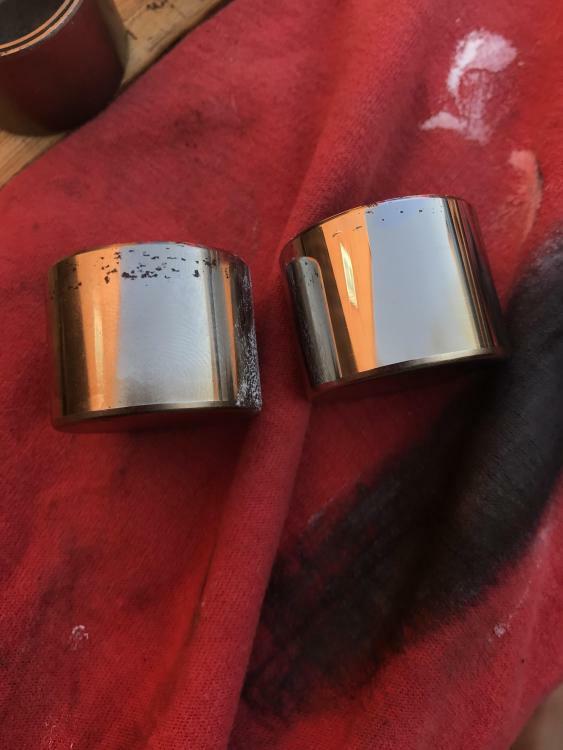 Piston on the left was dangerously pitted and could easily have ripped a seal if pushed into the caliper. Now it is brought back into serviceable shape. Next, clean off the polish residues with brake cleaner and apply a dab of superglue on the worst pits. Superglue will adhere to the new oxide layer (and any remaining rust) to protect the areas where chrome has failed. Let the superglue dry for at least an hour as it takes ages when left open like this. Then run a new razor blade over the glue to remove the blobs that stick out. Scrape it both ways. Final rub down on a clean cloth to smooth everything out and you’re done! 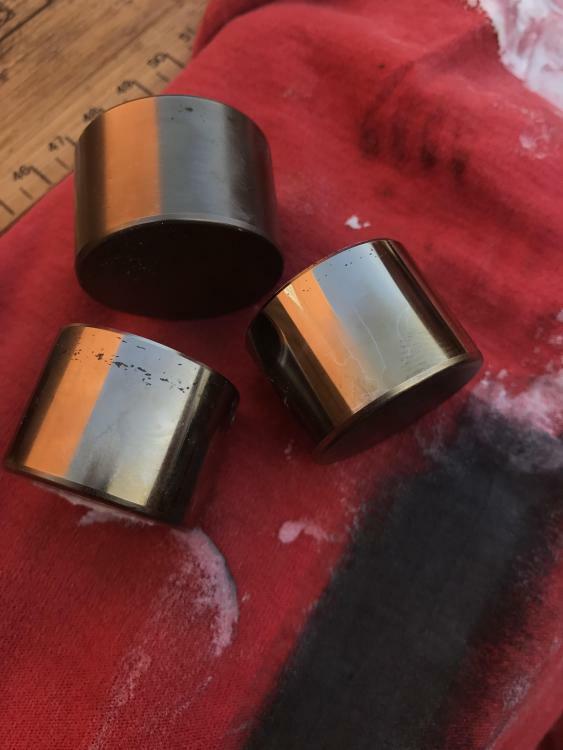 Caveat: a pitted piston will not be improved by this method - it will only get wise with time. Also, don’t rub too much of the existing chrome away as you will end up with failures elsewhere soon. Always install with a good amount of silicone grease/brake paste to prolong protection. I wonder why we still use steel pistons when anodised alloy and even better, plastic, could be used to better effect. Good tip with the superglue ! I've used liquid metal or araldite in the past for the same effect. Re steel pistons, well its the fact that the auto industry is predisposed to use steel. It's strong & cheap. Strangely Aluminum is the worlds most abundant metal, its easily obtained, its easily processed & its easily worked. But because alloying was not really prevalent until the late twentieth century, industry used steel & is still a dinosaur using what it knows. R&D costs money after all. Besides, who's gonna buy my spare parts, if no rust & wear. Not to mention, people often think industry exists to make the perfect product, when reality is it exists purely to make profit & that means components designed down to a price point, that will survive the warranty period ! If it was not for reputation, most things would fail just after 1,2 or 3 year warranty period. Then you'd have to buy a replacement ! Alloy is a poor metal for brake caliper pistons due to its high thermal conductivity. Titanium is better, low heat conductivity, lighter than steel, high strength & no corrosion. But it would mean the pads run hotter, so may require different compounds. A Plastic or Polymer may be available that is suitable to cope with both the heat & pressure. But as disc surfaces can reach 500c, with much of that heat being absorbed through the pad & dissipated via the backing plate & the piston contact, then to the caliper body & brake fluid. Which is why brake fluid boils if the brakes are over worked ! I agree on all points. Must try the Araldite tip - sounds good. 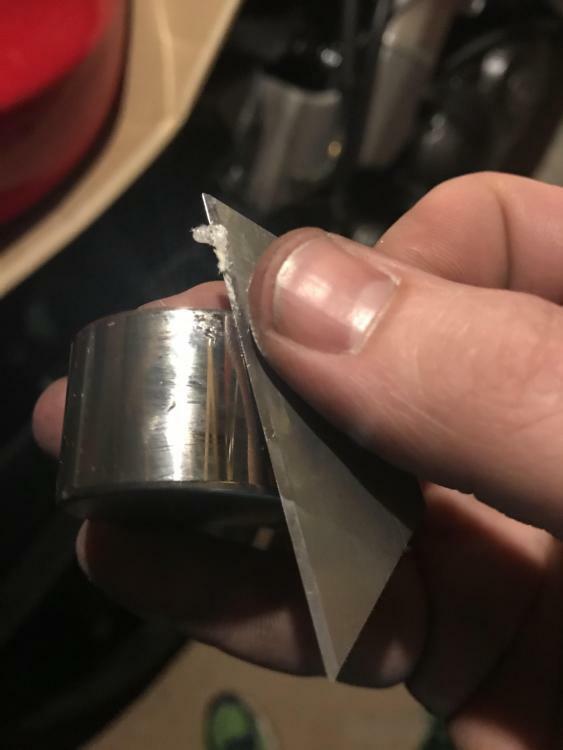 There are plastic pistons available, called Phenolic. 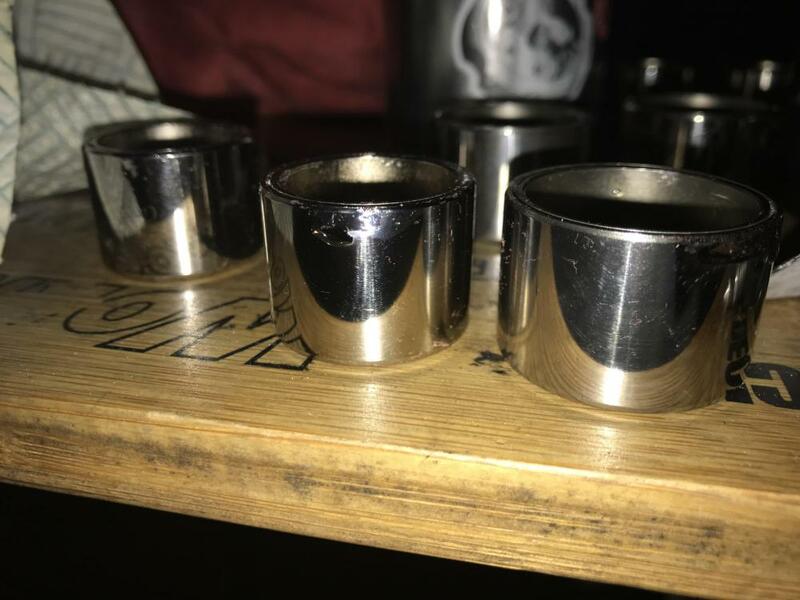 Link here: https://www.frentech-uk.co.uk/products/phenolic-pistons/. Would save lots of heartburn (and landfill) if these were fitted as standard. Friend of mine worked for London Underground. There are rooms there built in the 1940s still running the original lightbulbs. He says they are ALWAYS left turned on! That was when lightbulbs were built to last forever. They now have a built-in obsolescence, just like our vehicles. Supermarket lightbulbs now scarcely survive 1-2 years. Mercedes Benz used to build cars with the view they would last forever. Then in the 80s they built cars to last 30 years. The last of those was a small C class in the late 1990s. They now build cars with a 15 year obsolescence. Most manufacturers go for 10 years or less. Throwaway culture also means mechanics no longer repair things - just replace. Lots of repair skills have been lost as a result. Very few people now know how to panelbeat, straighten rims, hone cylinders etc. There was a time when every neighbourhood had a machine shop and just about anything could be fixed. Anyway, thank God for Autosol and bits of old denim!